The next generation of Scotty Cameron Select putters – introducing new four-way sole balancing technology – continues the evolution of a line engineered for performance, milled to precision and designed with elegance. Available in golf shops worldwide beginning March 30, the 2018 Select line advances Titleist Master Putter Maker Scotty Cameron’s proven multi-material construction methodology of combining face inlays of either 303 stainless steel or 6061 aircraft-grade aluminium with stainless steel bodies for superior balance, weight distribution, sound and feel. The new Select line features seven tour-validated modern blade and mid-mallet models. The new Select Laguna joins Scotty’s classic Select Newport, Newport 2 and Newport 2.5 blade styles, while the popular Fastback and Squareback names return in updated mid-mallet offerings. Rounding out the line is the heel-shafted mid-mallet Select Newport 3. The 2018 Select line employs three unique setups – incorporating Scotty’s innovative face inlays that wrap around the sole and disappear from the player’s view at address – to complement each putter shape and size. The new 2018 Select Newport, Newport 2, Newport 2.5 and Laguna models are modern heel-and-toe weighted blades designed to support flowing strokes in several player preferred setups. Each model features a sole-to-topline 303 stainless steel inlay that is precision mid-milled and hand-buffed to a brilliant, metallic finish, then bonded to the stainless steel body using up to 30 percent more high-tech vibration dampening material than previous models. This fusion of materials provides golfers with ultra-responsive feel and feedback at impact. The 2018 Select Newport 3 is a heel-shafted mid-mallet, based on the classic Newport head shape, designed with a flow neck (with ¾” offset) for the player who needs additional toe flow in his stroke. Multi-material technology – featuring a precision milled, lightweight 6061 aircraft grade aluminium face inlay fused to the precision-milled 303 stainless steel body – distributes weight for higher MOI performance. A left-handed Newport 3 was also added to the line for 2018. The Select Fastback and Squareback mid-mallets combine 6061 aircraft grade aluminium inlays with Scotty’s wrap-around face-sole technology. The face-sole component is a single piece of lightweight aluminium that wraps down and around to create the midsection of the sole. This construction concentrates weight on the perimeter to produce higher MOI and stability for “straight back/straight through” strokes. The lightweight aluminium face-sole is fine tuned for sound and feel through increased vibration dampening material attached to the stainless steel core. Both new models have been refined with a milled sightline in the flange in lieu of the pop-through feature. Select putters will be available on March 30 worldwide through Titleist authorised golf shops and will be priced at A$579/NZ$649. 1st of 500 models will be available on March 23. 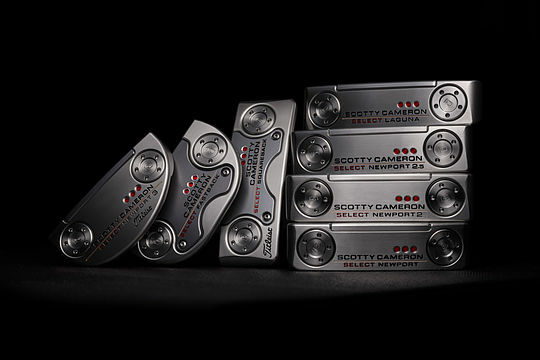 Visit www.scottycameron.com and www.titleist.com.au for more information.